Today, we continue the Pray A to Z series, and Q is for uniQue Needs. As we think about unique needs, we mean families with special needs and ongoing health challenges. Some of these needs are visible to the eye, others are not. You can catch up on the entire series here. You can download your free prayer cards here. 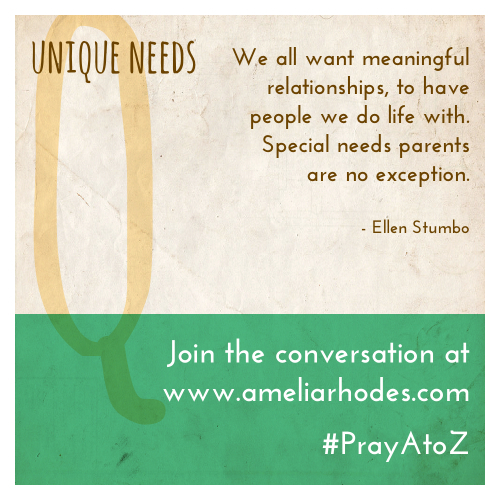 Today’s post comes from Ellen Stumbo, mother, pastor’s wife, writer, and founder of Disability Matters. I leaned against the wall in the church foyer, excited yet exhausted after a week of Vacation Bible School. “What a crazy week!” I said. My friend Sara stood just a few feet away from me, a smile on her face, watching some kids run around while their parents chatted. “You know what I dream about?” She asked. My friend Sara is a speech therapist, and she works with kids with disabilities often. I knew she had a heart for kids with special needs and their families, and I admired her for that. But it just wasn’t my thing. I wasn’t thinking her idea was great. Instead, I was thinking it would be a lot of work and not something I wanted to be involved with. I felt God had not given me a passion for kids with special needs, so why would I be involved with that? While she talked about her dream, I was running an inner monologue of how God had not “called me” for that job. That conversation in the church foyer with my friend Sara replays in my mind over and over. Why? Because I had such a strong conviction that I wasn’t “called,” yet several years later I gave birth to a baby girl with Down syndrome. The irony of the situation has never abandoned me. When my daughter was born, I struggled with her diagnosis. I shook my fist at God. I asked him “Why me? What have I done to deserve this!” My head was spinning, my heart was aching, and I was utterly devastated that this was now my fate. I was now a special needs mom, we were now one of those families. When my daughter with Down syndrome was two years old, we adopted a little girl with cerebral palsy. Talk about God changing my heart! My view of disability has changed. Yes, it’s changed because I now parent children with disabilities, but mainly because in this journey I’ve had to face my own brokenness. I am not the same young lady standing in the church foyer, thinking that reaching out to special needs families did not apply to me. I am member of the Body of Christ, and we all need each other to function. Being a part of the disability community – and a pastor’s wife – has opened my eyes to the need that special needs families have. Many special needs families feel isolated; many feel they don’t have many friends willing to understand and help. Some families even feel like the Church has pushed them away. Life becomes a little more challenging when you parent children with disabilities, but it makes a big difference when you sit in the church foyer and someone comes and sits by you so you don’t have to be alone at church. It make s difference when you are invited to a gathering, even if you cannot make it, and even if the person inviting you knows you cannot make it, that invitation means so much. It makes a difference when you get a card in the mail saying you were missed at church, or the moms group, or story time. We all want meaningful relationships, to have people we do life with. Special needs parents are no exception. Parenting is hard, parenting children with disabilities make makes it a little bit harder, a little bit lonelier, and a little bit more worrisome (health concerns, delays, maybe lack of mobility or speech). Pray, be a friend, please, be a friend. Ellen Stumbo is the founder of Disability Matters. 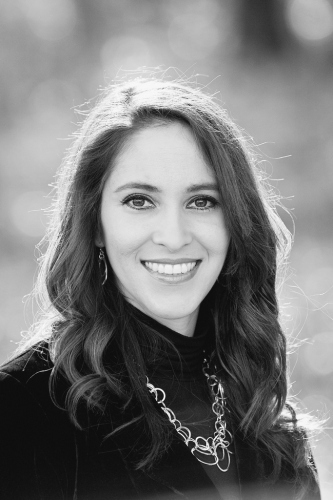 She is a writer and speaker who focuses on sharing the real -sometimes beautiful and sometimes ugly – aspects of faith, church, disability, parenting, and adoption. Ellen’s writing has appeared on Focus on the Family, LifeWay, MomSense, Not Alone, Mamapedia and the Huffington Post. Ellen blogs at ellenstumbo.com and you can also find her on twitter and Facebook. Write down names of families and children you know who have special needs, unique situations, and ongoing health concerns. Ask God to show you how you can be a friend to these families. Pray for our churches to be welcoming communities for families with special needs. Pray these families will not feel isolated or alone, and that they will have meaningful friendships to do life with.